Home >> Generated from JAN's SOAR Information System on 4/21/2019 12:42:08 AM. 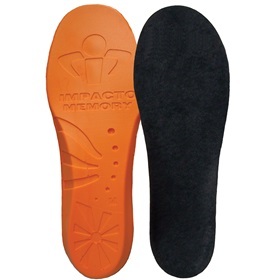 Impacto® Memory Foam Anti-Fatigue Insole is made with memory foam to reduce pain and fatigue when standing, walking, or running for long periods of time. Provides excellent comfort, impact absorption, and support. Molded style insoles conform to the foot’s natural curve, and can be trimmed with scissors for the best fit. Soft fabric cover wicks away moisture. Made with industrial-grade materials to ensure a long wear, and PVC-free. Made in USA.